Work-life balance is something we aspire to but rarely achieve. This is particularly the case for people who work too much, including workaholics, or people who are addicted to work. Workaholism or work addiction was first used to describe an uncontrollable need to work constantly. Although there is extensive literature on the subject, work addiction is not a formally recognized medical condition or mental disorder included in the DSM. Work-life balance is the ideal state of having adequate income, accomplishment, and fulfillment through work, while maintaining an equal level of satisfaction through non-work social and recreational pursuits. Workaholism, or the opposite, underemployment or unemployment, both interfere with work-life balance. Most commonly, people who are concerned about work-life balance are working people who want more time for relationships and family, but find that work has taken over. Most of the people struggling to achieve a good work-life balance are not addicted to work, but are hard working, ambitious adults, or parents struggling to make ends meet financially. Having put most of their energy into establishing a career—which is much more difficult than it was forty years ago—it becomes hard to let go and unwind at the weekend or during the holidays. And for some, issues like facebook addiction, smartphone addiction, and internet addiction can make it harder still to focus on relaxation, time with partners and children, and pursuits that you can’t put on your resume. A good work-life balance means knowing how to relax and switch off from work, and actually doing this. 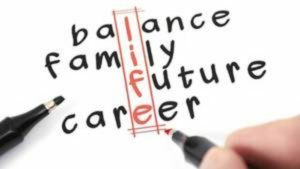 Part of work-life balance is feeling good about doing this, having absolutely no sense of guilt or obligation about working or not working, and recognizing the benefits of a happy and fulfilling personal life to your success and happiness at work. One of the most effective ways of achieving good work-life balance is to find your optimal level at work and settle into it. You don’t always have to go for a promotion, more responsibility, or more money, if it is beyond your optimal level of performance, and you are constantly struggling to catch up. A better strategy is to find a job you really enjoy and can perform well at, and set your lifestyle goals accordingly. This could involve a career change or even a step down the career ladder. Another way to balance your work and family life is to talk to, and more importantly, listen to your partner and family about what they want to do. You don’t have to just do what they want, but try and find some common ground and experiences you can share. You might not find it as stimulating as work, but in time, you will find it more fulfilling. Finally, don’t enslave yourself to your employer. Work the hours you are paid to work and no more. Take your vacation and do something fun. Take sick time when you are ill. These are rights that have been fought for so that workers can have a decent quality of life—have respect for your predecessors and appreciate their efforts. What If You or Your Partner Is a Workaholic? If you try these strategies and find you just can’t stop yourself from working, it might be time to seek professional help. A psychologist or counselor can help you to understand why you feel the need to work so hard, and can help you listen to and empathize with your partner. Approaches such as CBT can help. Talk to your doctor if you need a referral, or seek out a therapist on the internet. Your state psychological association can give you information on qualified service providers in your area. Copyright © 2019 Workers Assistance Program, Inc. This entry was posted in Balance, Family, Home, Well-being, Workplace. Bookmark the permalink.